Hot on the heels of Friday’s custardy SHF entry, is another type of custard: cheesecake. The first time I read Lori’s excellent post on making the best cheesecake on the planet, I was sold. Did you know that she used to make cheesecakes for a living? I wanted to try making her bulls eye cheesecake, but I chickened out after preparing the batters. 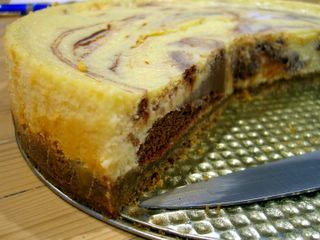 I was nervious about pouring even chocolate and plain layers into the pan, so I settled on making a marbled cheesecake. I filled the pan with large, haphazard dollops of batter and swirled them together with a knife. This cheesecake does not need to be baked in a water bath, so that makes it that much easier. Cheesecakes crack when they are exposed to a sudden temperature change. Cool your cheesecake in a fairly warm place after removing it from the oven to allow the custard to set without cracking. Make sure to chill it overnight in the refrigerator; creamy cheesecakes taste their best when cool. When you are going to serve the cheesecake, keep a moist dishtowel at hand and wipe down the knife after each slice. This will keep your slices clean and even. Is it really the best cheesecake on the planet? I will say that it is outstanding. The plain cheesecake has an excellent flavor. The chocolate cheesecake is incredibly rich and chocolately without being heavy or truffle-like. Overall, it isn’t too sweet and the whole thing is unbelieveably creamy. The thick crust is a perfect balance to the richness of the cheesecake. I would not change a single thing about this recipe. In truth, I do not think that I eat enough cheesecake to really pass judgment on a global scale, but I will say that it is certainly the best I have had in recent memory. Mix together graham cracker crumbs, sugar and melted butter until mixture is wet (or pulse in a food processor until crumbs clump together) and begins to stick together. Spread mixture evenly in a 9 inch springform pan and press down firmly. Bake for 10 minutes. Set aside. Melt chocolate into a medium sized bowl. In a large bowl, beat cream cheese until smooth. Add condensed milk and beat until smooth. Add eggs, one by one, beating each until fully incorporated. Pour 1/2 of the batter into the bowl with the melted chocolate and stir well. Pour chocolate and plain batters into the prepared pan, evenly distributing and alternating batters. Swirl with a clean knife. Bake cheesecake for 50-55 minutes. It will not look totally firm when done; it will jiggle. The whole cake should jiggle evenly, though the center might be a bit looser. Cool cheesecake at room temperature for at least 1 hour before refrigerating. Refrigerate overnight or at least 4 hours. Your cheesecake looks great! I have done a few of them – have you tried leaving it in the oven (with it off and the door ajar) for about 1 hour after it’s done? I’ve had some success to prevent cracking with that as well. That’s why I love coming here in your blog. I’m like you searching out for those ‘ultimate’ recipes. Sometimes the best are ones with the shortest recipe list like this one. Thanks for sharing! Nic- have you ever played around with tofu cheesecakes? I know I know… it’s almost a dirty word! I’m just wondering if you’ve taken out some of the dirty work on this one already. Joe – That’s a really good trick! I’ll have to try it next time. Celia – Thank you! Who isn’t tempted by a short recipe with a tasty photo? McA. – You know, I haven’t tried yet, but I do have some vegan cream cheese in my fridge, so perhaps I’ll give it a shot soon. It seems like it might turn out pretty well. Tanvi – Thanks. You should have seen how fast it was eaten! Sweet LORD that looks amazing! My favorite dessert of all time is CHEESECAKE. Mmmm. Marbled (with chocolate) has got to be one of the top flavors for me. Great site, I always enjoy your posts and beautiful pictures! MMMMMMMMMMMM!!! I have never baked cheesecake before! But will definitely give this a try. It looks to good to miss! Sounds delicious though! And looks great too! I tried a marbled cheesecake years and years ago, and today looked up marbled cheesecake, and saw this pic of your one. I think it is the same one. I always remember that one from years ago as it was the most delicious thing I have ever tasted! I have your receipe, its almost ready to go in the fridge. 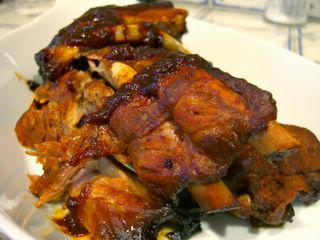 I cant wait to taste it again after all these years of wondering how to make it…. thank you! !